It is a difficult question, but one that as a reputable conservatory company we have to find the correct answer to. We do not want to dig any deeper than we have to as there is no financial advantage to us in doing so, similarly our clients do not want to pay us to dig deeper than is necessary! However, both our clients and ourselves have a common interest in ensuring the foundations are of sufficient depth to avoid future problems. The layman might be surprised to discover that there is no distinct defined standard for conservatory foundations, the best available guidelines are from the NHBC (National House-Building Council) and relate to new dwellings. Where Building Control approval is required for a conservatory extension, these are the standards to which the local authority Building Control department will work. The answer will vary from site to site and depend on local ground conditions and nearby trees, but in practice we normally dig to at least one metre below ground level. In some cases one metre will be superfluous, but the difference in cost between digging to one half a metre or one metre is often relatively small. In some cases, the foundations will need to be deeper than one metre, in highly shrinkable clay with nearby trees, or on made-up ground. Another determining factor is the invert level of any nearby drains, the bottom of the footings must be at least as deep as this. It is usual for us to dig foundations deeper than those on the existing building and not uncommon for foundations to be up to two metres deep. This is pain for all concerned, but an necessary evil. The answer really depends on access and the size of the conservatory. For a large conservatory with good access, a mechanical excavator is the quickest and most economical way of digging foundations. For sites with restricted access, there is no choice but to dig by hand! However for smaller conservatories, this can be more economical and cause less disruption. Chalk is relatively firm and drains water away well. Nearby trees have no significant effect. Standard strip footings are most suitable as long as they are deep enough to be in solid chalk. Clay holds water and is susceptible to shrinkage as it dries and heave as it gains moisture. Nearby trees can draw up moisture causing shrinkage leading to structural problems. Many new houses are built on sites that were once used for another purpose, hospitals, airfields, factories or even schools. Generally these get levelled by the developers, houses built then the garden back-filled with rubble and covered in top soil. Some areas of the site may be on virgin ground suitable for a strip footing, other gardens may contain a substantial depth of rubble. 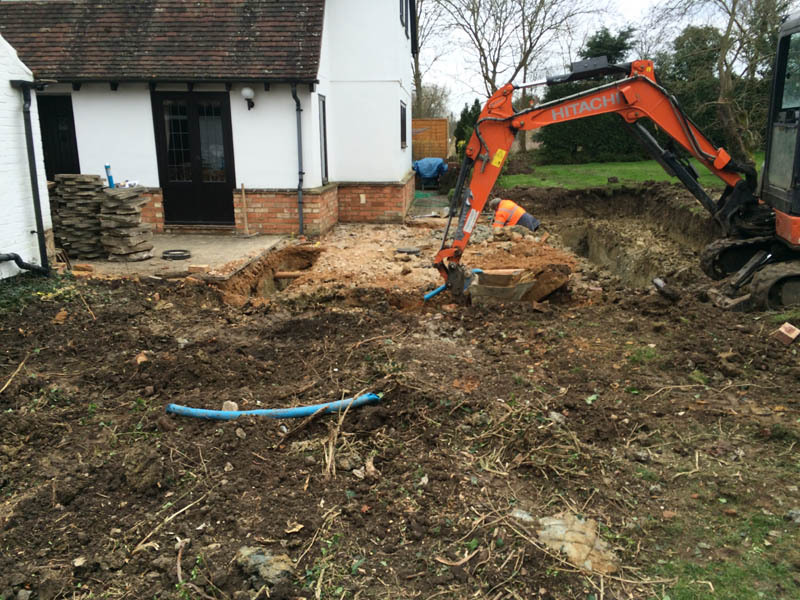 If the foundations need to be more than around two metres deep and the site is not suitable for a reasonable size digger, it becomes more economical to use piled foundations. Piles are very quick to install and save a lot of the mess and other potential problems associated with deep strip footings., such as trench collapse and water ingress. We can use a highly portable rig in restricted access situations that will drive steel-cased piles deep into the ground, until they stop up at the required resistance. This is typically around seven metres, though occasionally further. Depending on the difference between outside ground and inside floor levels, either a reinforced concrete slab or a reinforced concrete ground beam will sit on top of the piles. Where a ground beam is required, we would fit a beam and block suspended concrete floor.